We’re previewing each of these forces to give you a taste of what the book can do to transform your business. To start from the beginning, read Force #1: Focus on Your Whales and Force #2: Be Conversion-Oriented. Many publishers make the mistake of thinking the key to profits and success is sheer traffic. And if you’re thinking, “Duh, Rob! More traffic! More money,” you’re not wrong. But you are working harder, not smarter. I didn’t name my book “A Member Is Worth a Thousand Visitors” for nothing. Rather than focusing on reeling in tons of small fish, stay focused on nurturing your relationship with your whales. Why? It’s five to seven times easier to sell to an existing customer than to find a new one. What’s more, the average repeat ecommerce customer spends more than double a new one. That’s data you (quite literally) can’t afford to ignore. That’s why the driving question behind the third force of online revenue growth is: what else can you sell to your whales? Let’s talk about how to perfect your upselling strategy. It starts with a product pyramid. A product pyramid is a practical framework for ensuring you have the right portfolio to offer your customers to capitalize on converting—and then upselling to your audience. At the base of the product pyramid, you have low cost, low margin products to attract your audience. In fact, they may even be free. As you progress to higher tiers, the number of customers in each level decreases, but the margins increase. The main purpose of this pyramid is to get your whales on board at a relatively low price point. Then you retain and upsell them over time. The right progression of products should be tailored to meet your whales’ needs and capitalize on the relationships you build with them. A product pyramid works because it helps you get the most bang for your buck. Sure, there are fewer customers at the top of the pyramid, but you’re adding the most value there, and therefore charging the highest fee. And chances are, a bulk of your overall profits come from the top few layers of your product pyramid, where your whales engage the most. Many companies have already figured out that they need lower priced options at the base of the pyramid to build their audience (this is the whole premise of “content marketing”). The real opportunity comes from finding that premium offering at the tip of the pyramid. When done correctly, you’ll find a significant increase in your profitability. Building the product pyramid is just the beginning. Once you have a slate of offerings, it’s time to focus on upselling. 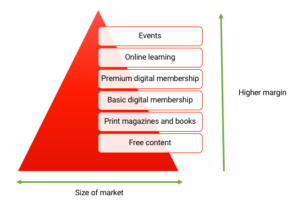 Because customers are unlikely to take the leap directly from free to premium products, it helps to view the pyramid as an upward path for your customer journey. Make any initial barriers to making that first purchase relatively low — wow them, impress them, give them what they want. Then you’ll see them move up the pyramid. The key to creating gradual movement from, say, casual blog reader to ardent fan is to leverage your customer data and target your marketing accordingly. If someone regularly opens newsletters to your free blog content, and they have on several occasions clicked through to a landing page for a course that covers a more in-depth look at that topic without making a purchase, perhaps there is a barrier in their way. By watching your data, you know they are interested and ready. You simply need to guide them to purchase. For the whole pyramid to work, you have to treat the members at the top like royalty! Don’t forget they’re the one giving you ideas for product innovation, content topics, and user experience enhancements. They’re also your sales and marketing team — favorable word of mouth is invaluable. 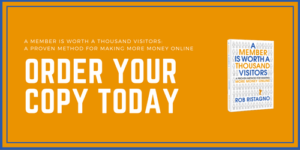 For more information on how to get started, strategies for upselling your whales, plus product ideas to help you structure every tier of your pyramid, order your copy of my book: A Member Is Worth a Thousand Visitors: A Proven Method For Making More Money Online.